The 2013 Mitsubishi Lancer GT doesn’t pack the advanced all wheel drive system of the high performance, turbocharged engine but with a roomy interior, a sporty exterior, a spirited yet efficient drivetrain and a purchase price just over $20k – the Lancer GT is a great compact sedan for someone who wants a fun to drive car but not the costs associated with the top of the line Lancer Evolution. Throughout the United States market, it is a safe bet that most people who are familiar with the Mitsubishi Lancer are more familiar with the Lancer Evolution which packs a high performance turbocharged engine and an advanced all wheel drive system. The Lancer GT does not include either of those attributes but this package includes a spirited, naturally aspirated engine mated to a front wheel drive setup that is easier on fuel while the exterior design closely follows the cues of the high performance Evo – creating a car that looks very much like the big brother Evo with a drivetrain that is more reasonable for those looking for a confident daily driver than a weekend race car. When the Mitsubishi Lancer was introduced in 2003 for the US market, the product lineup was similar to what it is now with a collection of “average” models and the high performance Evolution package. During that first stint in the US, the Evolution and non-performance Lancer sedan had two very different exterior designs so if you wanted the aggressive look of the Evo; you had to buy the pricier, less efficient Evo. However, beginning with the 2008 model year, the Lancer and the Evolution share a basic exterior design that has really done wonderful things for the non-performance packages – especially on the 2013 Lancer GT that we are reviewing today. Gone is the pedestrian, bubbly design of the “normal Lancer” and in its place is an overall design that is far more aggressive than past Lancer sedans with a great many cues shared with the high performance Evo. Across the front, the 2013 Mitsubishi Lancer GT has a nose similar to the Evo, which is accentuated by the blacked out center section of the fascia that separates the upper and lower grille. This differs from other non-Evo Lancers that have two distinct sections of grille with a body colored portion across the middle and honestly, I love the look of the Lancer GT front end. When you add the Evo-like grille, the sporty front chin spoiler, the fog lights with integrated cooling ducts and the aggressive look of the angular, angry looking headlights – the Lancer GT packs much of the same exterior attitude as the more powerful Evolution. Along the sides, the 2013 Lancer GT has a profile that looks very much like the high performance Evolution with a low, sporty stance thanks to the GT suspension package and the 18” alloy wheels. These wheels differ quite a bit from those offered on the Evolution but when compared to the 16” rollers found on the SE model – these wheels go a long way in adding to the sporty nature of the GT package. The mirrors, door handles and pretty much everything else along the side are finished in either black or body color (not much chrome on this car other than the badges and the grille) and that also adds nicely to the sporty feel of the GT. The GT package also tacks on a fairly large rear spoiler that is similar to the one found on both the Lancer Ralliart and the Evolution package. While this spoiler is smaller than some of the monster wings available on past Lancer models, it is bigger than pretty much anything on the market today and along with the aggressive front end, the big rear wing helps the Lancer GT stand out against the compact sedan crowd. The 2013 Mitsubishi Lancer GT looks enough like the high performance Lancer Evolution that a great many people might mistake it for the go-fast model and while that might not sit well with the Evo owners who like to stand out from the crowd- the decision to make the Lancer GT look so much like the Evo was a great decision by the company. Finally, those who want the aggressive looks of the Evo without the high fuel consumption, the high performance engine or the high price can get what they want in a car that is still fun to drive. In a segment where aggressive design has come to be so important – the 2013 Lancer GT offers an exterior that looks like one serious performance compact. The 2013 Mitsubishi Lancer GT is somewhat of a budget sport package so you won’t find some of the higher end bells and buzzers that you will see on the Lancer SE but at the same time – this isn’t an interior that makes you go without. The stereo system is simple but it still sounds great, with good old fashioned buttons and knobs (no fancy infotainment screen) controlling the radio, CD and USB input functions with full controls on the steering wheel. Much in the same style of the stereo system, the HVAC output is controlled by three big, easy to use knobs so for those trying to avoid high tech gadgetry – this is an interior that you will enjoy. Also, in an era where many automakers have gone to very upscale, high tech gauge clusters, the Lancer utilizes a large tachometer and speedometer with a smaller, full color information display in the middle. While the button-clad steering wheel and the manual shifter are wrapped in leather, the Lancer GT’s sport seats are finished in cloth with manual adjustments. Keep in mind, those who want a high end sound system from Rockford Fosgate or a big, bright infotainment touch screen can add those options before purchasing but in base form – you wont find those features on the GT model. One area where I was especially impressed by the 2013 Mitsubishi Lancer GT was in the spaciousness of the interior with tons of room for the driver and front passenger. While this is a compact sedan, Mitsubishi has done a masterful job of designing the interior to squeeze out every possible bit of space so the driver and front passenger both have plenty of elbow room between each other as well as lots of leg room and head room – even for very tall drivers and passengers. The seat adjustments are simple (6 way driver, 4 way passenger) but they still allow for a great range of travel so whether the driver is 4’11” or 6’5” – they should be able to get comfortable behind the wheel. As it the case with many compact sedans, when the front seats are pushed all of the way back to accommodate a tall driver and front passenger things get a little tight in the back seats but with both front seats set for a 6 foot tall person to be seated comfortably, there is still enough leg room for adult passengers in the back. Those adults won’t be able to stretch their legs out but at the same time, they won’t spend the ride with their knees jammed into the back of the front seats. Again, the Mitsubishi Lancer GT doesn’t pack many of the frills that you will find on the other vehicles in the segment or even on other Lancer trimlines but it still offers a roomy, comfortable interior with a sound system that will belt out your music without the high price of many modern infotainment systems. The interior may be looked upon by some as being very bare but the Lancer GT really doesn’t exclude anything that a driver really needs to enjoy the car. Shy of high tech features that just frustrate and confuse some drivers (and passengers), the Lancer provides everything that is needed to make this a great car for daily driving or a long trip across the country. The 2013 Mitsubishi Lancer GT is powered by a 2.4L MIVEC 4-cylinder that sends 168 horsepower and 167lb-ft of torque to the front wheels via a 5 speed manual transmission. This is the “middle of the road” engine, sitting between the 2.0L option that provides 148hp for the DE and ES models and the turbocharged 2.0 that offers 237hp in the Lancer Ralliart or 291hp in the Lancer Evolution. The Lancer GT’s 2.4L mill provides a nice mix of performance and fuel economy for those who want a compact sedan that is fun to drive yet who doesn’t need the big power of the turbocharged models. This engine is also available with a Continuously Variable Transmission (CVT) for those who don’t want to do any shifting on their own but having driven both – I would strongly recommend the manual transmission. The is a setup that is far more entertaining to drive with a touch of sports car feel that you don’t get with the CVT although the CVT offers nearly identical fuel mileage. There is also the fact that the GT costs a few hundred dollars less than the Lancer SE that features the same drivetrain but more luxury items inside. What makes the 2013 Mitsubishi Lancer GT special compared to the other non-turbocharged models is the GT tuned sport suspension and the 18” alloy wheels. These two features work together to offer a sporty ride that gives the driver a great feel for the road without being quite as rigid as the high performance suspension packages found on the likes of the Evolution and the Ralliart. Mind you, the Lancer GT doesn’t offer quite the road hugging cornering abilities of the turbocharged models but it provides enough of a difference over the lower trimlines that someone looking for a fun to drive compact sedan will be able to get their kicks without compromising ride quality. The Lancer GT allows the driver to cut hard through some back country roads or tear along longer, higher speed turns on the highway with an equal amount of confidence regardless of the setting. This is a sedan that you can throw at a sharp turn and come out on the other side with a smile on your face while, more importantly, it will comfortably serve as a daily driver in all sorts of situations. Sure, the Lancer GT isn’t as much fun to drive as the higher performance, all wheel drive Evolution but it is dramatically more fun than a great many vehicles in the segment that offer similar interior space, similar fuel economy measures, a similar price point and less power. The Mitsubishi Lancer name is best known in the racing world for its efforts in off-road venues and while the Lancer GT lacks the advanced all wheel drive system that makes the Evolution the off-road monster that it is – the many unpaved roads gave me a chance to feel out the Lancer GT on what the state of Michigan refers to as “natural beauty roads”. There are a great many people in the Milford area who live in these dirt roads and have to travel them daily so I spent some time driving these roads with pretty impressive results. Once again, the GT isn’t going to tear though deep, muddy corners like the Evo but the suspension system handles the ruts, bumps and sloppy footing very well. Also, when you turn off the traction control system, the Lancer GT even offers some of the mudslinging action that has made the Evolution so famous – even if the GT was only using the front wheels to throw said mud. Last but certainly not least…we come to the fuel economy of the Mitsubishi Lancer GT. When mated to the manual transmission, the EPA expects that the Lancer will offer 22mpg around town, 31 on the highway and a combined figure of 26mpg. During my 8 days of driving the Lancer GT with a pretty even mix of highway and city driving, I averaged 25.8mpg. Granted, this is below what the EPA expects but I frequently found myself driving the Lancer GT harder than I would many compact sedans because – well – it seemed to handle those driving conditions very well. When you push some compact sedans, they feel strained and uncomfortable but the Lancer GT is a great deal of fun to drive in almost any situation. That is a very good thing for someone who loves to drive but we all know that hard driving has a negative impact on fuel economy. That being said, considering how hard I drove the Lancer GT and still got very close to the EPA estimates, I believe that someone with a gentler touch and a lighter right foot will have no problem meeting or beating an average of 26mpg. 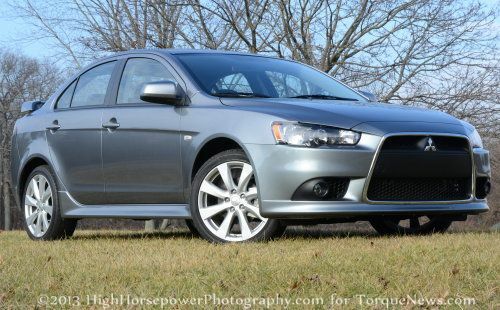 The 2013 Mitsubishi Lancer GT doesn’t pack the big power or the high tech all wheel drive system of the mighty Evolution but it does offer a similar, aggressive exterior design, a spacious interior with lots of trunk space and a drivetrain that makes it one of the more powerful cars in the class. Those buyers who are in the market for an aggressive, sporty compact sedan with a reasonable balance of power and efficient – the Lancer GT could be a great choice. Best of all, with a price starting under $20,000, the Lancer GT is less expensive than a great many of the similarly equipped cars in the segment. If big power is your main concern, you may want to lean towards the Lancer Evolution but for those who want a good looking sedan that is fun to drive – this is a car that you need to drive before making your next big purchase. I love going fast so the Evolution has long been among my favorite cars on the market but with the exterior revisions made to the Lancer GT coupled with the 168 horsepower engine, I really enjoyed my time behind the wheel of this affordable, efficient compact sedan. This is a car that looks aggressive on the outside with a drivetrain that can provide some driving excitement while still making trips to the gas station less painful than those models intended specifically for high performance driving. Thanks for giving me an idea before buying.I will think twice about fuel economy..